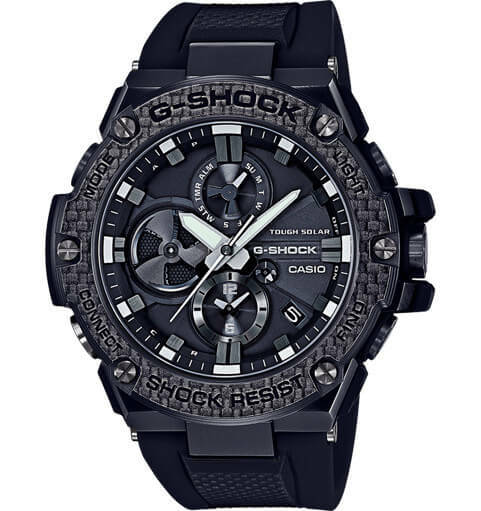 Casio just announced the all-new G-Shock G-STEEL GST-B100 featuring Tough Solar power and Bluetooth connectivity. Like the other G-STEEL models, the GST-B100 has a layered guard structure for superior shock resistance but is 2 millimeters slimmer than the original GST-S100. The launch models include the GST-B100-1A with resin band, the GST-B100D-1A with stainless steel band, and the special edition GST-B100X-1A with a carbon fiber bezel and resin band. The GST-B100 is the first fully analog G-STEEL model and has a subdial for dual dial world time. Another distinguishing feature is the unique dial indicator at the nine o’clock position which resembles the turbine blades of a jet engine. This dial rotates to graphically indicate elapsed stopwatch time, alarm setting, or battery level. The Connected Engine Module supports a Bluetooth connection to a smartphone to automatically adjust the time with internet servers, or to use a smartphone app to adjust the alarm and world time settings. A phone finder function is also available. The GST-B100 measures 58.1 x 53.8 x 14.1 mm, which is similar to the original GST-S100 (59.1 x 52.4 x 16.1) but significantly slimmer. The slimmer size is the result of the shock-resistant resin layer being incorporated into the case. The special edition GST-B100X-1A combines Torayca carbon fiber and Nanoalloy resin technology for a striking bezel design and also has a sapphire crystal. 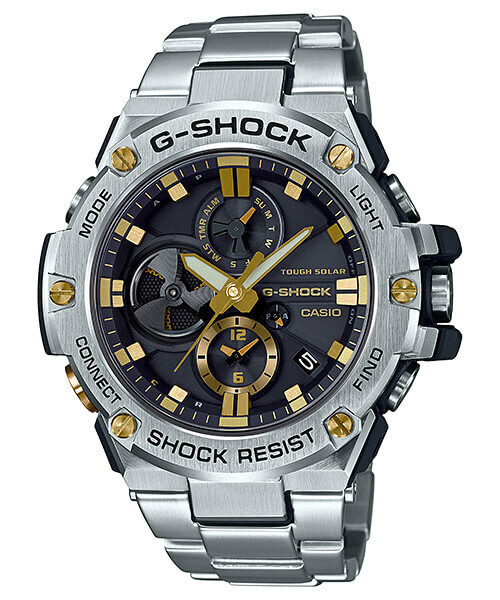 This exciting new release for G-Shock is another affirmation of the brand’s dedication to technological innovation. 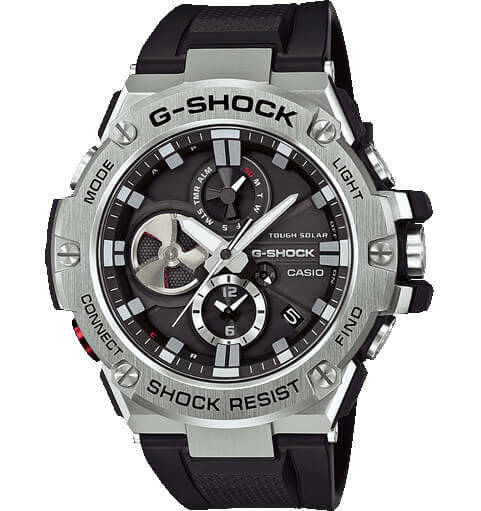 This is the third G-Shock watch featuring Tough Solar and Bluetooth connectivity (behind the GPW-2000 Gravitymaster) and MRG-G2000), and it looks like the Connected Engine Module may become a more common feature in future models. Update: The GST-B100-1A, GST-B100D-1A, and GST-B100X-1A are September 2017 releases in Asia. G-Shock Japan also announced the GST-B100-1AJF (¥50,000 JPY), GST-B100D-1AJF (¥55,000 JPY), and GST-B100X-1AJF (¥85,000 JPY) for September 2017, as well as the silver and gold GST-B100D-1A9JF (¥55,000). Update 2: Casio America announced the GSTB100-1A ($320), GSTB100D-1A ($400), and GSTB100X-1A ($700) for an October 2017 release. Update 3: The silver and gold GST-B100D-1A9 is an October 2017 release in Asia. The GSTB100D-1A9 will also be released in North America in November 2017 with a list price of $400 USD. GST-B100-1A: Stainless steel bezel with resin band. GST-B100D-1A: Stainless steel bezel with stainless steel band. GST-B100X-1A: Carbon fiber and resin bezel with resin band. Special features include a sapphire crystal with anti-reflective coating and stainless steel band keeper. 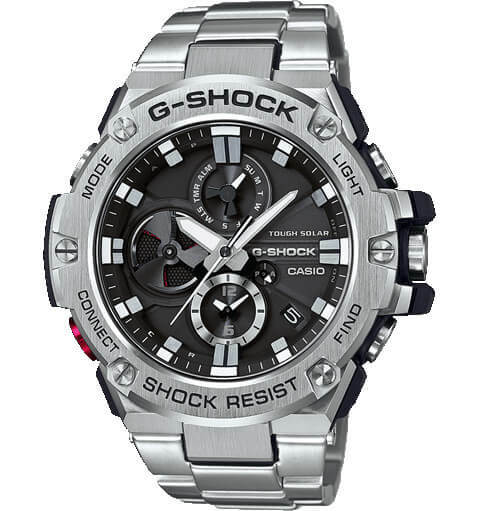 GST-B100D-1A9: Stainless steel bezel and stainless steel band. That carbon fiber model is making me hot. I want. May turbine blades rotate constantly or they rotate only with some functions? I believe just for certain functions, see the video we just added. It’s the same watch, “ER” at the end just means it is meant to be sold in the European market. The rotating blades feature – what colour indicates a full charge? is it red or black? When they will release a black version of GST B100D 1A9? I like it with black version and a gold accent to it.